Fire Sprinkler makes it quick and easy to design high-quality fire sprinkler protection systems in Autodesk® Revit®, with automated real-time updates for project changes. This ensures you get accurate bills of materials and builders work drawings, and accurate on-site assembly. The software incorporates NFPA, AU and ISO standards and can accommodate any others. 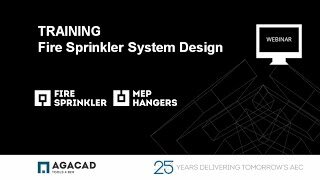 It uses simple yet flexible rules to distribute sprinkler heads instantly throughout a current or linked Revit model with the clash tolerance you specify. It also properly sizes system pipes and automatically connects them based on the visually-depicted routing option you choose. MEP Hangers functionality, which is included, enables the instant large-scale insertion of hangers and supports for accurate on-site assembly of sprinkler system pipes. We also recommend the separate Cut Opening solution to easily create openings with fire safety components where sprinkler system pipes intersect with walls, floors, roofs, ceilings, beams and columns. By downloading the Fire Sprinkler App, you will also receive our TOOLS4BIM Dock. The Dock gives you the option to install additional Revit add-ons developed by AGACAD. These other Revit extensions cover a range of industries, including Metal & Wood Framing, Ventilated Facades, Curtain Walls & Panels, Precast Concrete, MEP, and more. Activation codes are sent automatically by email for trials and purchases of Tools 4 Revit add-ons. Codes are sent manually by email for purchases of BIM Solutions. The trial version and full version are both included in the Fire Sprinkler App. After downloading the app, you will have the option to take a free 14-day trial or to purchase. Activation codes are sent via email.